For more than 20 years, I did a lot of groundwater flow and transport numerical modeling. This work prepared me well for my current career in business analytics, but life sure would have been easier if I had Tableau Desktop back then! 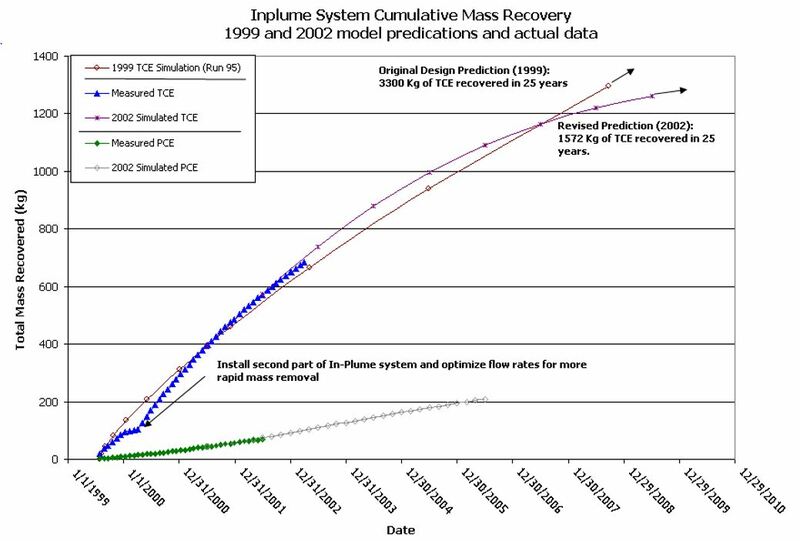 I just came across a Powerpoint from 2003 (click here for models_at_mmr) that has some nice examples of visualizations and comparisons of measured and simulated data (Figure 1 and 2) from over 15 years ago. This file gave me a chance to look back at my Massachusetts Military Reservation (MMR) groundwater modeling work from the late 1990’s to early 2000’s. What we used to call model calibration and verification is now called model training and testing in the world of statistical business analytics. Instead of running finite-element and finite-difference models, I now run regression models and perform visual and statistical analytics on data from a wide variety of businesses. 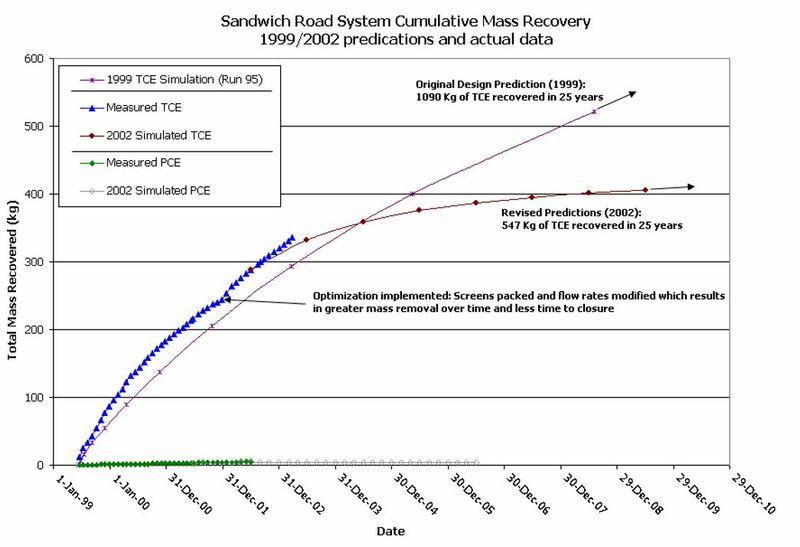 Although the simulations and software tools are different and the computers are now much more capable, the modeling goals remain the same. In any type of modeling, we attempt to simulate natural or human-impacted processes so that we can predict future system behavior. In many ways, running deterministic or stochastic groundwater models in four dimensions (x,y,z, and time) is not much different than trying to predict which marketing campaigns to be conducted in a retail business will lead to better sales. What I have come to understand and appreciate is that (1) all models are approximations of reality, (2) data is how we measure responses and quantify the processes, and (3) all predictions are intrinsically inaccurate. Our goal in simulating a system is to minimize the inaccuracies in our predictions. When we can do this successfully, there is a lot of fun to be had. I now have this understanding because I have had a lot of time to learn about data, how to use it, manage it, analyze it, and to incorporate it into models that predict future system behaviors. Tableau, What Took So Long? One of my biggest regrets is that I had to work the first 20 years of my career without Tableau desktop software. Looking back, I can see how so many computer codes I designed and wrote, or software teams that I directed, were necessary because we didn’t have a tool like Tableau to help us perform our analysis. There were capable tools we used like TecpPlot and Autocad for visualizations, but much of the quantitative analysis had to be programmed on a case-by-case basis. If I had Tableau throughout my career, things would have been much easier, more insights would have been possible, and better models could have been built. Now that Tableau is here, I’d like to take another crack at analyzing some of my earlier work. I think that this is one of the reasons why I appreciate Tableau to the degree that I do. When you try to do something yourself in a computer program and you realize the complexity of the task, having a tremendously capable tool like Tableau really opens up your world to unlimited possibilities. For this, I thank the founders of Tableau on a daily basis. I found this post very interesting. I reminded me of how I became interested in dynamical systems. I happened to come across an article about a hydrologic model of the Okefenokee Swamp in Georgia. The articIe contained differential equations representing the model. I developed various dynamical models of the swamp in various programs like STELLA, Vensim, Mathematica, and even LiveMath (which for some reason still is close to my heart). When I later became chief of Acute Psychiatric Services at a Psychiatric Hospital I developed a lot of models of health services, especially acute psychatric services, in the hope that these models would increase my understanding and the understanding of health service administrators and polititicians and thus lead to an improvement in the sevices. This however did not happen and has still not happened. Now, STELLA has quite good presentation methods, so I thought that the fact that administrators and politicians did not see the light of day immediately was an indication that they were not really interested in solving the serious problems of the acute psychiatric health services in Norway but mainly interested in decreasing the cost of those services. This is surely at least partly true. After reading your post I began to wonder whether it might partly be due to their inability to gain the necessary insight and understanding from the STELLA presentations and my comments on them. Perhaps it would be possible to increase their insight and understanding by presenting the underlying data and the data from simulations in Tableau Workbooks. Perhaps the clarity of these presentations and their availability to the public would make it imposible for them to avoid doing something about the problems. Thanks for writing such a great comment. One clear insight that I have gained in 27 years as a consultant is this: If you cannot explain your results in a simple and easy to understand manner, chances are good that you will not get additional work. If your results are not presented clearly and concisely, the accuracy of your models will not be appreciated, nor will your insights be transferred to your client. People need to see results visualized in clean, crisp graphics. That is one reason why Tableau is so successful. Tableau makes data easy to understand.